Just because courses are going online doesn’t mean reading isn’t important anymore. But just because reading is still important doesn’t mean students should carry around textbooks. Students should be able to access their readings directly from the course site and navigate from there to any other relevant page, e.g. a source linked in “Instructor Notes”. 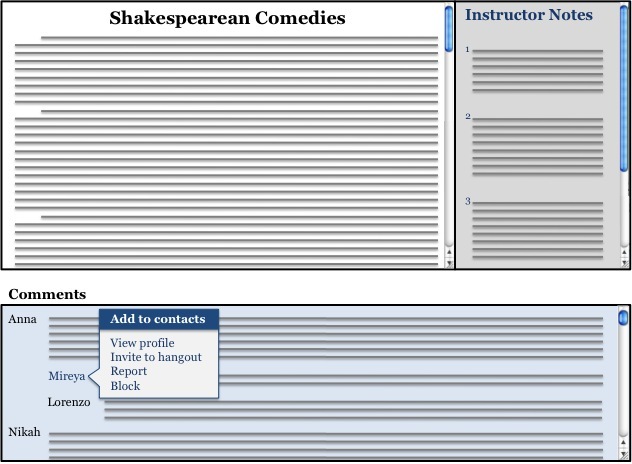 In this mock-up, students are able to discuss the readings in comments below, similar to online news articles, and communicate at a deeper level if they choose. Let’s say a student clicks on Mireya’s profile.